As you probably know, the Japanese have a remarkable sense of space – particularly in Tokyo. They can cram an insane number of people onto trains, and they’re known for capsule hotels and incredibly efficient tiny apartments. This holds true for their shops, as well. 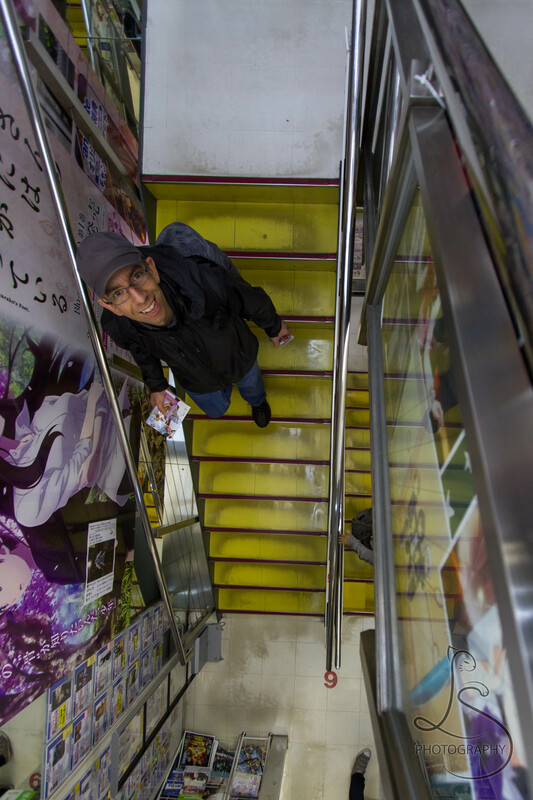 The cramped shops in Akihabara were unlike any we typically see in the States. Where you might find a small American storefront in a little beach town, those in Tokyo are anything but cozy. Every inch of space is utilized, from products hanging from the ceilings to directories printed on the vertical surfaces of stairs. Aisles are only as wide as they absolutely have to be; most allow only for one-way traffic. Many stores span multiple floors (often six or more), but each may contain only one or two aisles of goods. You’d never suspect so many microgenres of manga, but I assure you they exist. Just be sure to pay for items on the floor you found them; each floor operates as a standalone store. After all, lines are inefficient. Smaller transactions keep folks moving faster. And the sounds! Auditory stimuli take very little space, so they are used in full. Every aisle has loud mini screens advertising the latest pop band or imploring you to buy the meticulously organized wares. By the time you venture far enough to be down to an acceptable volume of one screen, you’re assailed by the next. We had to step out into the rain and bustling sidewalk just to take a breather, but it made for a very unique experience. I feared for my sanity. 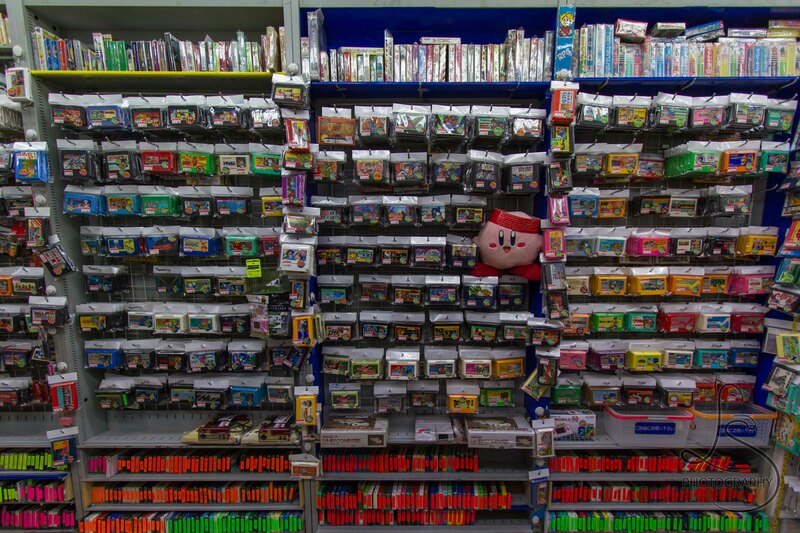 A small store in Akihabara, Tokyo, Japan houses countless console game cartridges. Overall, I can’t see shopping like that on a regular basis. But I also can’t deny those shops have a lot of character, and I look back with a muddled sense of horrified fondness. And the next time we find ourselves in Tokyo (yes, there will be a next time), I’ll be sure to pop in for a dose of Japanese spacial ingenuity. Have you ever been to Akihabara? What were your first impressions? If you like this post, please help us grow by liking it and sharing it on social media. We also welcome your comments below – we would love to hear from you! Don’t miss out on new posts! Follow our blog for new posts every week.